On fine-needle aspiration cytology, cytological features may be like pleomorphic adenoma (PA), adenoid cystic carcinoma (ACC), mucoepidermoid carcinoma, epithelial myoepithelial carcinoma and papillary cystadenocarcinoma. We report a case of PLGA, which presented with upper lip swelling and ulceration giving a clinical picture of squamous cell carcinoma (SCC). A 45-year-old male patient presented with an upper lip swelling for 1-year. Swelling was gradually progressive, painless with ulceration. The swelling was 4 cm × 4 cm, firm, nontender, nodular with ulceroproliferative growth of 1.5 cm × 1.5 cm in size towards mucosal surface of upper lip. Patient had a history of smoking for 10 years. There was no history of tobacco chewing. No submandibular, cervical or preauricular lymph nodes were enlarged. Provisional clinical diagnosis of SCC of upper lip was considered. Fine needle aspiration cytology smears stained with Giemsa and Papanicoloau were highly cellular. Cells were arranged in flat sheets in a myxoid background and also in the pseudopapillary pattern at places. Cells were cuboidal to columnar with uniform, round or oval nuclei and a moderate amount of cytoplasm and inconspicuous nucleoli. Hyaline stromal globules seen occasionally. There was no necrosis and mitosis. A diagnosis of PLGA was made, and excision of the tumor was advised. On histopathology, gross specimen was 2 cm × 2 cm grayish white, lobulated, noncircumscribed with ulcerated surface. Hematoxylin and Eosin stained tissue sections showed various histological patterns. The patterns were tubular, cribriform, papillary and tubulopapillary. The tubules were round to irregular in shape, and some were cystically dilated lined by cuboidal epithelium. Cells were having moderate amount of cytoplasm, distinct cell boundaries and round to oval, pale nuclei with or without conspicuous nucleoli. Some of the tubules had eosinophilic secretions in the lumen. The stroma was scanty. Diagnosis of PLGA was confirmed [Figure 1]. Polymorphous low grade adenocarcinoma is a low grade malignant tumor also known as low grade papillary adenocarcinoma, terminal duct carcinoma and lobular carcinoma. PLGA usually present with an asymptomatic mass in the oral cavity. Present case presented with ulceroproliferative lesion in upper lip. Grossly the PLGA is a polypoid tumor, unencapsulated, lobulated, firm and rarely ulcerated with smooth cut surface with size range of 1-5 cm. Present case measured 2 cm × 2 cm, lobulated with ulceroproliferative area. PA is nearly always circumscribed. It lacks the infiltrative, noncircumscribed character of PLGA. In the present case, the gross specimen was noncircumscribed. Microscopically, different architectural patterns can be seen in PLGA. The most common patterns of growth include tubular, trabecular, solid, and cribriform patterns, with a focal papillary pattern identified less frequently. Myxoid change in the background may also be seen. In contrast to the architectural polymorphism, the nuclei are uniform and bland with absent or negligible mitoses. The differential diagnoses of PLGA are ACC and PA. On cytological examination cells in PLGA are cuboidal or columnar unlike basaloid features characteristic of ACC. They have vesicular nuclei and often conspicuous eosinophilic cytoplasm. The cells in ACC are arranged in cribriform pattern and have high nuclear: Cytoplasmic ratio with hyperchromatic nuclei and coarser chromatin whereas the cells in PLGA are plump or columnar with papillary or fascicular pattern. PA is composed of proliferating stromal, epithelial, and myoepithelial cells in a chondroid matrix. The typical benign plasmacytoid myoepithelial cells characteristic of palatal PA are seldom observed in PLGA. In our case, on histopathology, architectural polymorphism is seen with cuboidal cells having round to oval, pale nuclei with or without conspicuous nucleoli as described above favoring PLGA. Present case clinically mimicked SCC because of ulceroproliferative growth. Squamous cell carcinoma has males predilection because of heavier indulgence in both tobacco and alcohol habits in most countries. It occurs predominantly in elderly males. Present case was also presented by a male patient. SCC of the lip arises almost exclusively on the lower lip. It is a slowly growing tumor. Immunohistochemistry (IHC) shows positivity with epithelial markers (cytokeratins, epithelial membrane antigen), S-100, bcl-2 and sometimes carcinoembryonic antigen, smooth muscle actin and vimentin. In addition, staining with S-100 protein is usually more diffuse and stronger in PLGA than ACC, which shows patchy positivity. Other markers such as c-kit (CD117) are of little use in practice, as staining can be seen in AdCC and most PLGAs. Much more reliable marker is the MIB1 proliferation index, which is almost always significantly lower in PLGA. IHC was not done in the present case. Complete surgical excision is the treatment of choice. Patients presenting with cervical metastasis, neck dissection should be added with excision. Polymorphous low grade adenocarcinoma grows slowly, and its behavior is indolent, with a 10-15% rate of local recurrence, 10% regional lymph node metastasis and rarely distant spread. Present case is followed-up for 1-year and patient is doing fine. Though painless mass is the most common presentation of PLGA but bleeding, telangiectasia, or ulceration of the overlying mucosa can occur occasionally. Pathologist and clinicians evaluating a case of PLGA should keep in mind that the clinical presentation of PLGA may simulate SCC sometimes. Luna MA, Wenig BM. Polymorphous low-grade adenocarcinoma. In: Barnes L, Eveson JW, Reichart P, Sidransky D, editors. Pathology & Genetics Head and Neck Tumours. Lyon: IARC Press; 2005. p. 223-4. González-Lagunas J, Alasà-Caparrós C, Vendrell-Escofet G, Huguet-Redecilla P, Raspall-Martin G. Polymorphous low-grade adenocarcinoma of the nasal fossa. Med Oral Patol Oral Cir Bucal 2005;10:367-70. Koss GL, Melamed MR. Salivary glands. In: Koss' Diagnostic Cytology and its Histopathologic Basis. USA: Lippincott Williams & Wilkins; 2006. p. 1246. Mills ES, Carter CD. Salivary glands. In: Sternberg's Diagnostic Surgical Pathology. Philadelpia: Lippincott Williams & Wilkins; 2010. p. 841-2. Orell SR, Sterrett GF. Head and neck; salivary glands. In: Fine Needle Aspiration Cytology. 4 th ed. New York: Churchill Livingstone, Elsevier; 2012. p. 69. Rosai J. Tumours of odontogenic epithelium. In: Rosai and Ackerman's Surgical Pathology. 10 th ed. St. Louis, Missouri: Elsevier; 2009. p. 260-1. Castle JT, Thompson LD, Frommelt RA, Wenig BM, Kessler HP. 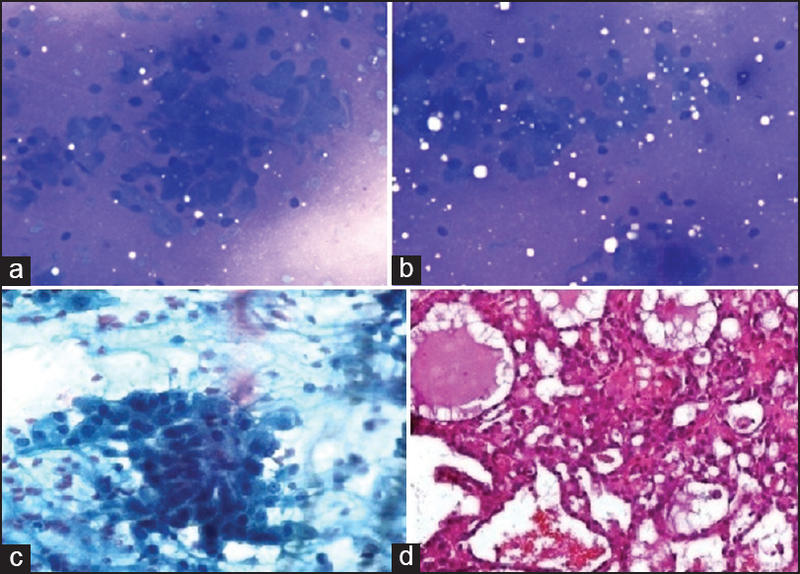 Polymorphous low grade adenocarcinoma: A clinicopathologic study of 164 cases. Cancer 1999;86:207-19. Cardesa A, Gale N, Nadal A, Zidar N. Squamous cell carcinoma. In: Barnes L, Eveson JW, Reichart P, Sidransky D, editors. In: Pathology & Genetics Head and Neck Tumours. Lyon: IARC Press; 2005. p. 118. Skálová A, Simpson RH, Lehtonen H, Leivo I. Assessment of proliferative activity using the MIB1 antibody help to distinguish polymorphous low grade adenocarcinoma from adenoid cystic carcinoma of salivary glands. Pathol Res Pract 1997;193:695-703. Lengyel E, Somogyi A, Gõdény M, Szerdahelyi A, Németh G. Polymorphous low-grade adenocarcinoma of the nasopharynx. Case report and review of the literature. Strahlenther Onkol 2000;176:40-2.